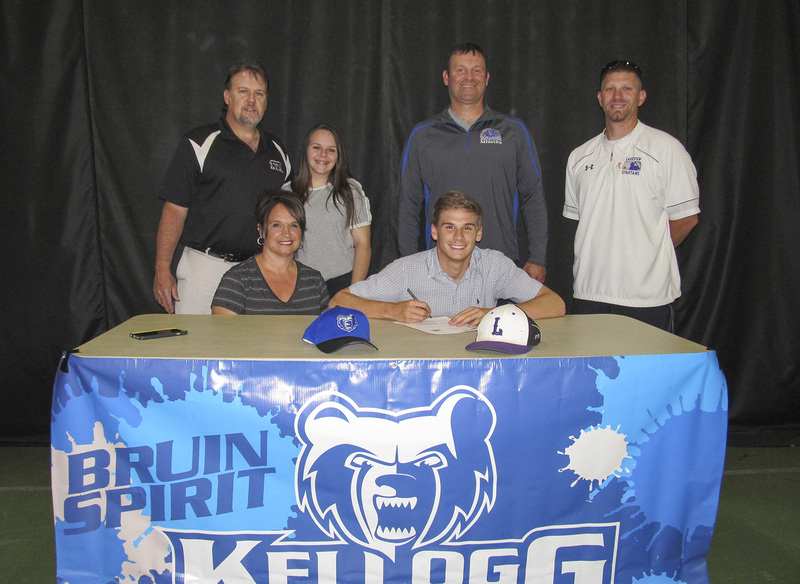 Ethan Eldridge, of Battle Creek, has signed a National Letter of Intent to play baseball at Kellogg Community College and will begin playing for the Bruins next season. Eldridge, a 2017 graduate of Lakeview High School, was a co-captain of the Spartans baseball team and earned All-City, All-Conference and All-District honors in high school and was nominated for All-State honors. The Bruins finished up their 2016-17 season last month as conference and state champions, ending with an overall record of 34-17-2 and a conference record of 20-4. For more information about KCC baseball, visit www.kellogg.edu/baseball. Pictured in the above photo, from left to right, are Todd Eldrige, Glory Eldridge, Lauren Eldridge, Ethan Eldridge, head KCC baseball coach Eric Laskovy and Lakeview High School baseball coach Kyle Kracht.